Published on February 17, 2014 May 25, 2014 by Kristina @ Family. Work. Life. It’s easy to get into a rut with our family’s meals. For four weeks I am posting my menu, links to the recipes I use, and hopefully giving you some fresh, new ideas for your kitchen. These are recipes my family has loved over and over, and I hope they give you some inspiration to try some new things with your family! Learn more about how this series came to be and what to expect! Saturday: Pad Thai – I feel this needs a little explanation. I love pad thai and would often treat myself to takeout when my husband was gone for the weekend. Then, I had a second child and the idea of loading up two kids, driving to the restaurant, unloading two kids, picking up my dinner, reloading two kids, driving back home, feeding two kids, getting them to bed, and then finally eating my dinner was exhausting and not worth the effort. And I wasn’t about to make it from scratch – have you SEEN the ingredient list? So I make this and call it the lazy version of pad thai. I sauté tofu, broccoli slaw, and rice sticks and then mix in the sauce from this recipe. It’s not exactly the same but it’s reasonable facsimile for right now. Though I do miss my takeout! 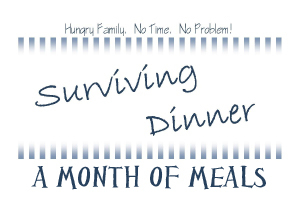 Wednesday: Lifegroup – not my turn to cook dinner! Thursday: Valentine’s Day Spaghetti Dinner at Conlan’s school. Another night off! Friday: This was Valentine’s Day so we had a fantastic dinner with friends and we brought cheese fondue. Right on budget – $136 for the week, not counting the fondue supplies. Those came out of our “takeout” budget, if it matters.